In a mixing bowl, dissolve the yeast in the lukewarm milk, add in the flour, mashed pumpkin and sugar. 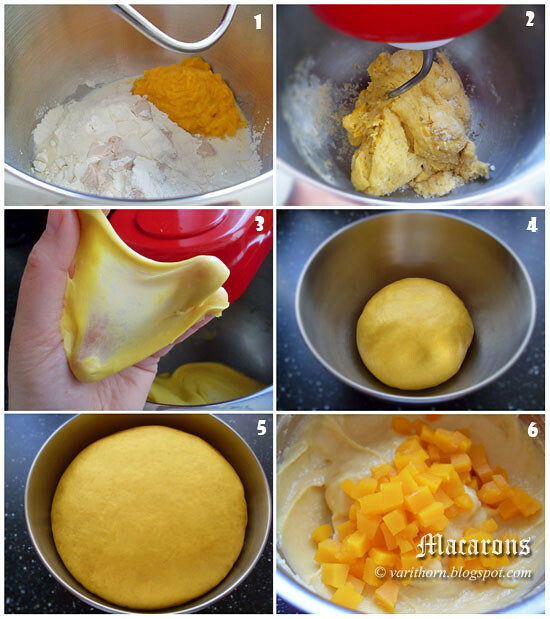 Mix together by using dough hook with low speed about 2 minutes. Then cover the bowl with the towel and rest in the warm place for 10 minutes. After that, add in butter, salt and vanilla. Knead with high speed about 10 minutes or until the dough is really smooth and elastic. Shape into the ball and cover with the towel, let rise in the warm place about 45-60 minutes or until double. In the meanwhile, we're going to make the custard filling. So that we do have the filling punctually when the dough is ready to be shaped. Whisk together sugar and eggs in the bowl. Then stir in whole milk and flour until well combined. Afterwards, pour the mixture through the finely sieve in to the small pot.Place the pot on the stove on low heat, regularly stirring until the custard getting thick. Turn of the heat and immediately stir in butter and vanilla butter flavor. 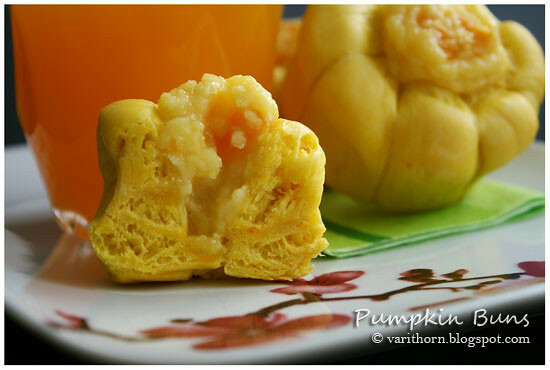 Pour in to the small bowl and mix in the streamed cubes pumpkin. Cover the surface with plastic wrap. Set aside to let it cool. When the dough is ready to be shaped. Take the dough out from the bowl and knead around about 30 secounds. The divide into 10 portions. Roll each portion into a long stick. (pic 7) Don't forget to cover with the plastic wrap. 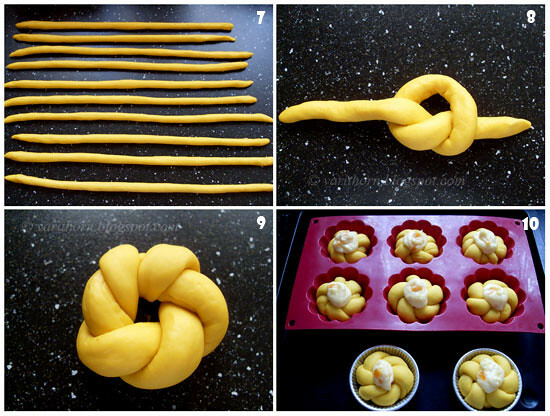 Braid the dough by taking both ending of the stick, tie into a knot and alternating twist from side to side until finish. Put into a greased muffin tin and pipe the custard filling in the middle. Proof for 30 Minutes, thereby don't forget to cover with the towel or plastic wrap. Warm the oven to 175C. When it get the right temperature, put the tin the the oven and bake about 12-15 minutes. Remove from the oven and immediately brush with butter. Cool on the wire rack. The buns turn out really good. Very tender and yummy. I'm loving it. 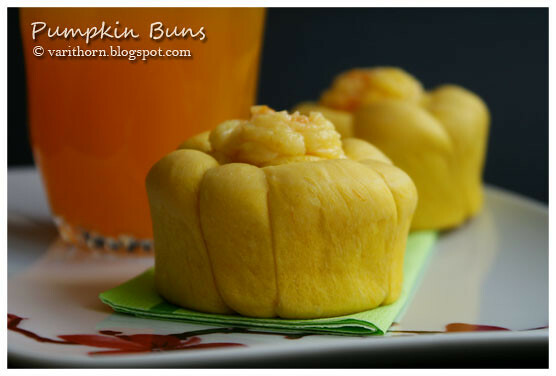 If you like bread and pumpkin, you shouldn't miss. See you soon next blog.